Khao Yai Wine Trails - bicycle tours in Bangkok Thailand. There's a revolution in wine production today, as the new New World wines of Thailand are making a stunning breakthrough into the considered world of wine appreciation. Grown and processed in the stunning Asoke Valley sitting at an elevation of 350m above sea level, the location is perfect for nurturing wine grapes, and of course tasting the finished product. 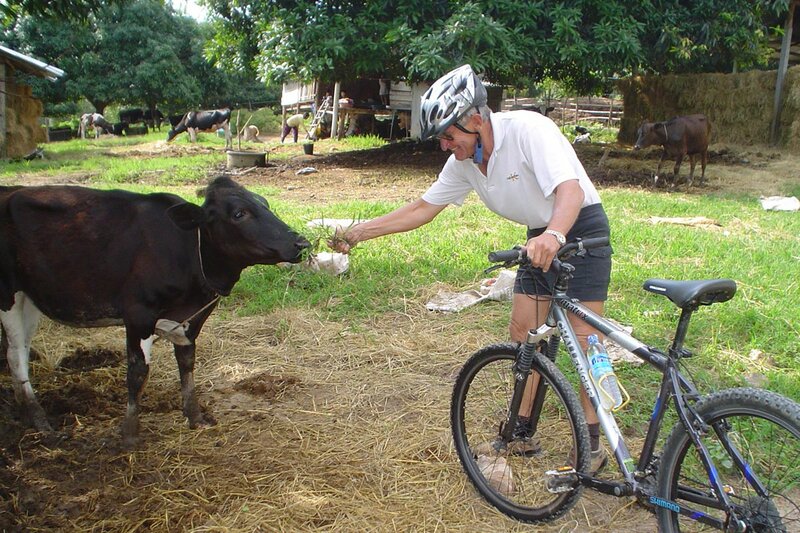 The rolling hills are also an ideal place for dairies and we'll pass many on our bicycle ride. We'll also take the time to visit a few temples, including the impressive 45 metre tall white Buddha at Wat Theppitak Punnaram. Riding the trails in this valley where vineyards and dairy farms coincide side by side you'll discover a wonderful little escape from Bangkok that combines fun bicycle paths with some wine tasting and delicious Thai food. What do we see? From Bangkok we drive north and east and start from a small Buddhist temple. After a look around we ride through patchwork countryside that could almost be France if it wasn't for the banana trees and occasional coconut palm to our first vineyard to Khao Yai winery where we ride through the vineyards before stopping for a mouth watering Thai lunch complemented by a glass of wine. After a tour of the wine making facilities it is a short ride to our resort. The following morning you will wake up in the very charming Cabbages & Condoms resort, surrounded by limestone mountains and nature at its very best. After breakfast you will be climbing a bit on the bike as well as off the bike! Climb to the top of two temples if your legs are strong enough as we'll also have a hill to cycle up as we pass tapioca fields, sugar cane fields and a rock quarry. We taste some juice at Prapatsorn grape farm before a hearty lunch is in order. After our thorough ride through Asoke Valley it’s time to head back to Bangkok (two hour drive). What is the riding like? The roads on day 1 of the Khao Yai Wine Trails are a mixture of tarmac, dirt and gravel. There are a few ups and downs but generally, the riding is relatively undemanding and requires no technical ability. On day 2 we ride up one hill and have some dirt road sections. An air-conditioned bus travels behind the group to support us and participants can cycle as much or as little as they like and still enjoy the same views as the rest of the group. This tour has been designed for the discerning traveler; someone that enjoys the countryside, likes to ride a bike and has a penchant for good wine and good food. It is also a really good tour for families. Khao Yai Winery: Set on a valley plain 300 metres above sea level close to Khao Yai National Park. Khao Yai Winery claims to be the birthplace of Khao Yai wine. The 800 acre plantation includes 200 acres of good quality grapes and a 3,000 square-meter factory including a fermentation room housing French-made 225-litre oak barrels with the capacity to mature 450,000 litres of wine, or 600,000 bottles a year. A cellar door is available and any wine you want to buy will be packed for safe transfer back to the hotel. Cabbages & Condoms Resort: Cabbages and Condoms are a small chain of restaurants and resorts owned by the Population, Community and Development Association, a Thai government organization set up by Khun Meechai Viravaidya. The PDA operates a wide variety of programs designed to serve and assist the rural poor of Thailand. These programs cover such diverse activities as free vasectomies, income generation programs at village level, forest replanting schemes, vegetable banks, industry relocation into rural areas, mobile health clinics, environmental education programs, and a democracy project. Located in the small village of Sap Tai, our resort is beautifully situated in a scenic valley surrounded by steep limestone mountains and in the shadow of Khao Yai, the big mountain. The resort is comfortable rather than luxurious but has a large swimming pool and a beautiful restaurant with a garden that is lit at night by hundreds of fairly lights. The food here is great and the service excellent. Note: Those considering this tour as a private trip might like to consider upgrading the accommodation to the nearby five-star Kirimaya Resort & Spa. Anything else? This really is a great trip for a family or for a small group of friends and we are happy to go any day of the week for private groups. Of course, water, soft drinks and snacks are all included every day and SpiceRoads supplies a TREK mountain bike and helmet. The trip is fully supported by our air conditioned minibus, fully equipped with a two-way radio and Thule bike rack. We make our ride along the rural roads, through orchards, fields and animals farm with some gradual climbs on the tarmac and some dirt paths before a nice tour of vineyard valley and taste Thai wine brand. Take your time at the picturesque pool of the resort is the great way to cool down before our hearty dinner. It's an easy chilling ride with a bit climb today. Still stick on the quiet roads passing local field and seasonal fruits gardens locally. The ride finishes at a temple with a white big Buddha sitting on the hill 112 metres above ground level. Easy ride with interesting countryside showing a lot of different agriculture. Great Thai food, experienced and affable guide. Most enjoyable. This was the perfect weekend break away from Bangkok. We cycled through beautiful countryside and were surrounded by fruit trees, local people working in the fields and very little traffic. Highlights were coming across a lovely Farmer's market and buying local organic produce. Would highly recommend. Great way to see the countryside and local life. I was impressed at how our guide managed to avoid busy roads yet we cycled on reasonably well maintained surfaces. We ride a total of 38 km over two days on paved roads that are in good condition and on dirt tracks. There are a some ups and downs, but generally the riding is relatively undemanding and requires no technical ability. This tour has been designed for the discerning traveler; someone that enjoys the countryside, likes to ride a bike and has a penchant for good wine and good food. It is also an excellent escape for families as all the vineyards also sell grape juice! Suitability: This tour is suitable for all level of riders and is a popular choice for families. The trip is fully supported and your guide’s expert knowledge of the area and terrain means that you always know what is coming up in terms of distance and difficulty. This makes a tremendous difference, as does the constant supply of cold drinks and fresh fruit while riding. Biking Conditions: This trip is a mixture of hard-packed jeep trails and tarmac. An air-conditioned bus travels behind the group to support us, and participants can cycle as much or as little as they like and still enjoy the same views as the rest of the group. Starting in Bangkok we drive north for two hours and arrive at Bonya Lit Temple. Here we’ll get on our bikes and start riding on a quiet country road. The road is a mixture of dirt and asphalt with lots of potholes as the road winds and undulates through small dairies, tamarind orchards and even a sheep farm. After 6 km we’ll turn off onto a shaded gravel road that skirts a pond and will leads us to a dirt road. Here we’ll be without vehicle support for 4 km as we ride through mango orchards and fields of sugar cane. After a rest stop by a lake we’ll ride on to Khao Yai Winery and lunch at the Hornbill Restaurant complemented by a glass of wine. We’ll then take a tour of the vineyard and taste some Thai wine. We then have just 4 more kilometres to cycle to our resort. The pool has a wonderful view and it’s a great way to cool down after a day of cycling. Bike hire is included in the tour. The bikes are well-knrown makes of hybrid or mountain bikes (depending on the tour) with lightweight alloy frames, 24- to 27-speed gearing, v-brakes and Shimano components and front suspension. Child bikes, tag-along bikes and rear child seats are available.